This is the real deal! 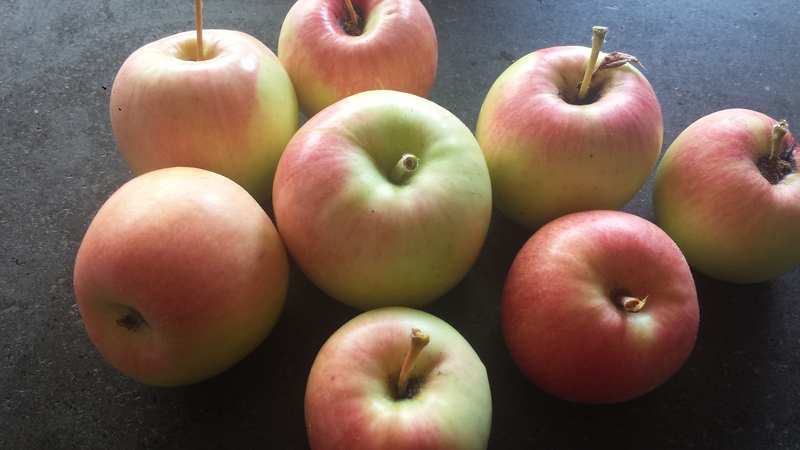 It’s been carefully smuggled onto airplanes in backpacks and suitcases, as a prized possession, leaving little room for clothing or personal belongings. 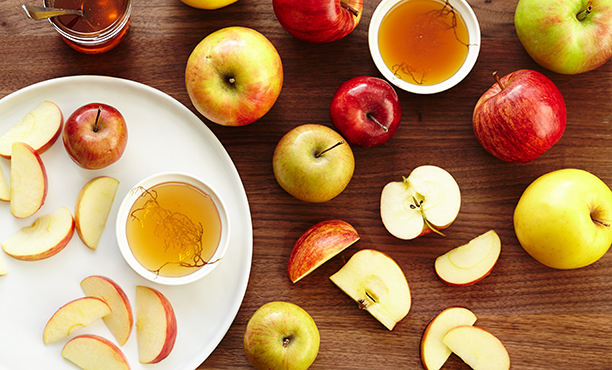 It has graced many a Break Fast and dinner table as guest of honor. 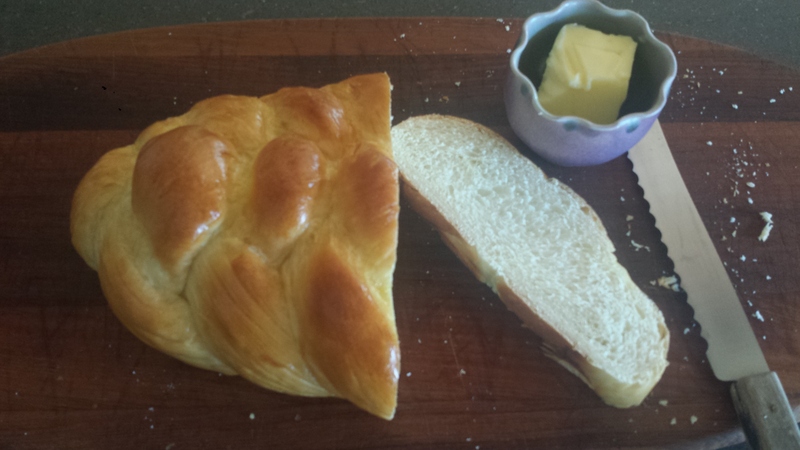 It has been slathered with butter and devoured by many teenagers who learned to show up in my kitchen on Fridays. 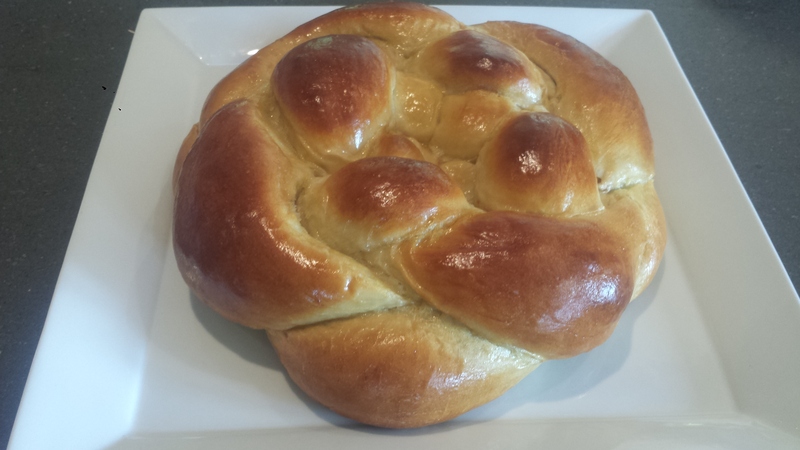 In my house it’s called MaryBeth’s Challah because I got the recipe from my friend, Marybeth. 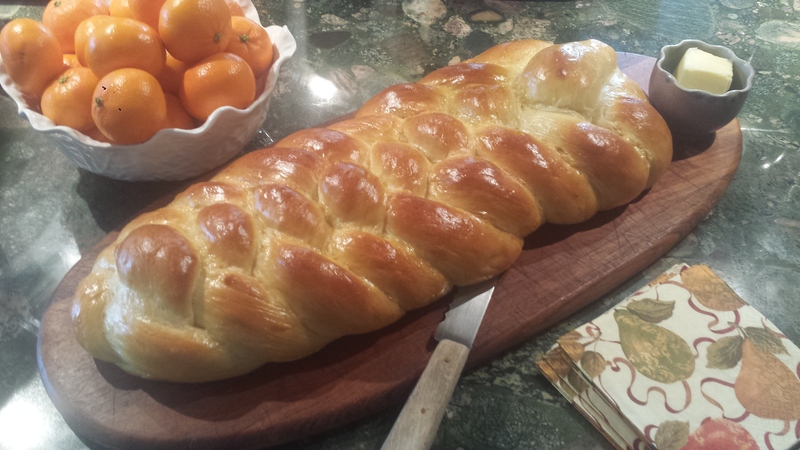 My next door neighbors call it Joyce’s Challah because… well you see the pattern here. 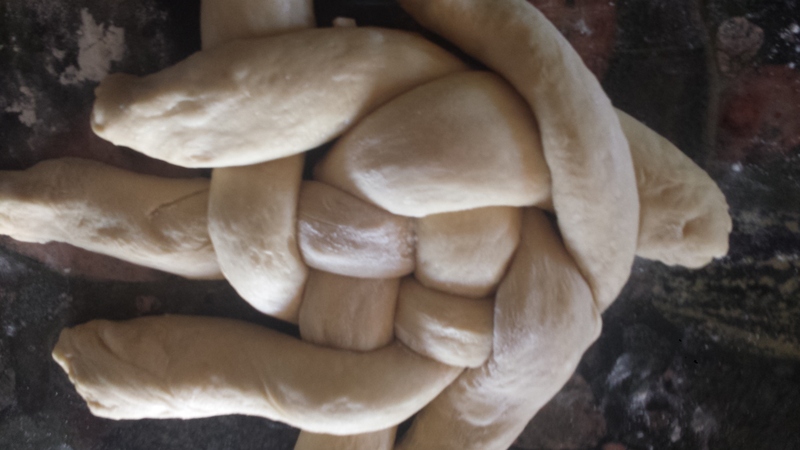 In addition to making a gorgeous bread, some people say there is a reason we use six strands to braid the challah for Shabbat. 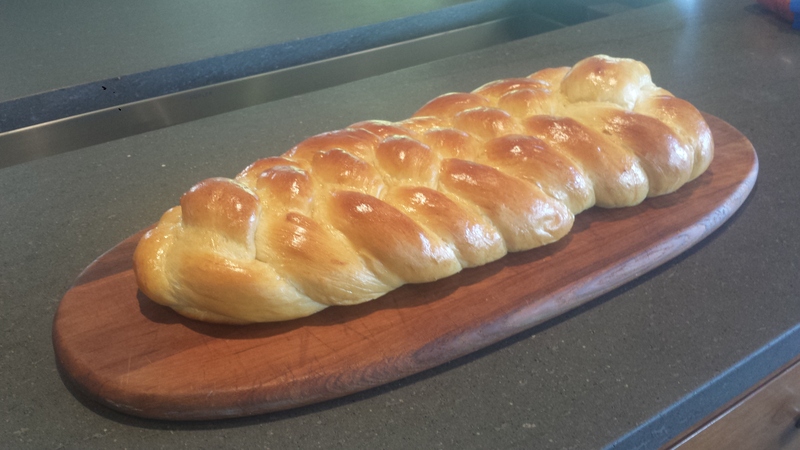 The six strands represent the six days of the week that we work and the challah represents the day of rest. 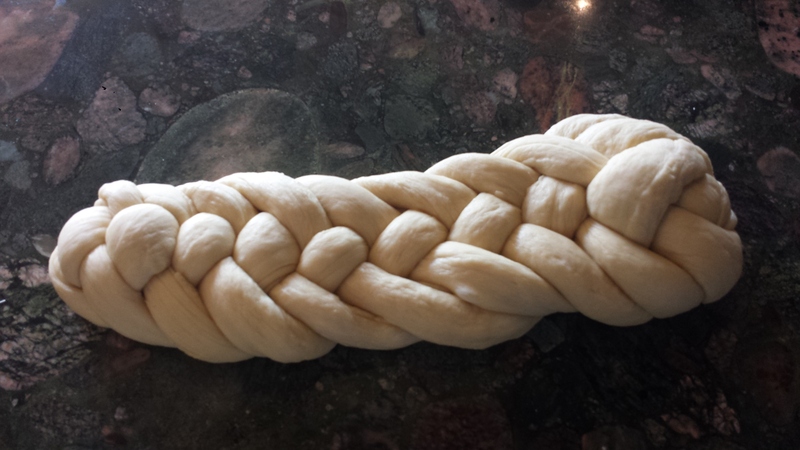 Braiding a six strand challah is easier than it looks. 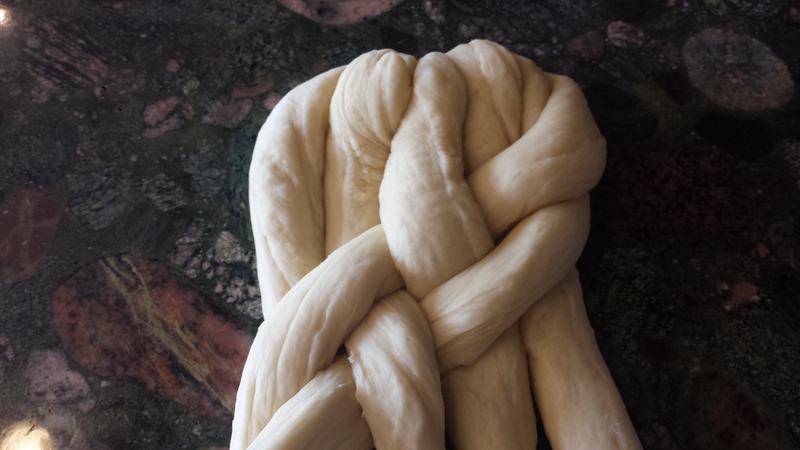 I have illustrated step by step instructions below but if you get confused, or just like to watch how to videos, here you go: How to Braid a Six Strand Challah You can make one large challah, like I have done here. 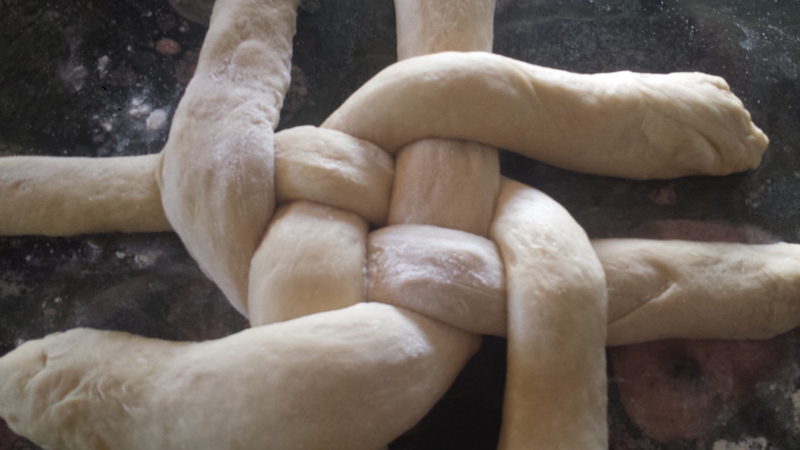 It is quite impressive in size and shape and, Warning!, hits both ends of my oven. 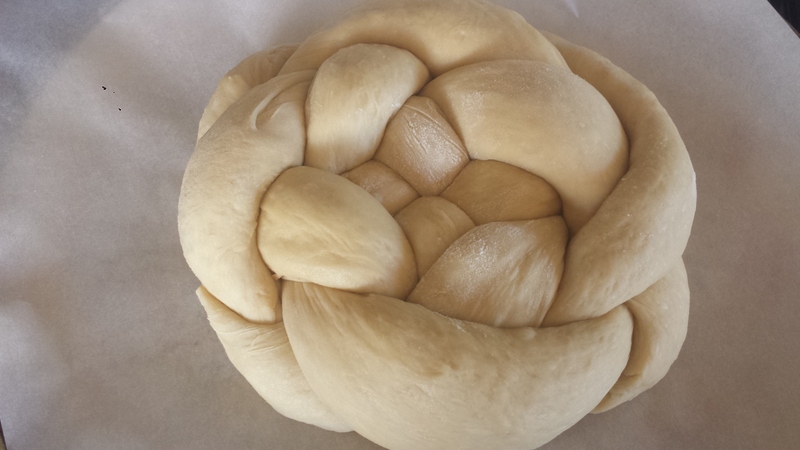 If your oven (or pan) is not large enough, you can divide the dough in half and make two smaller but equally beautiful challahs. The times listed are suggestions and not rigid guidelines. 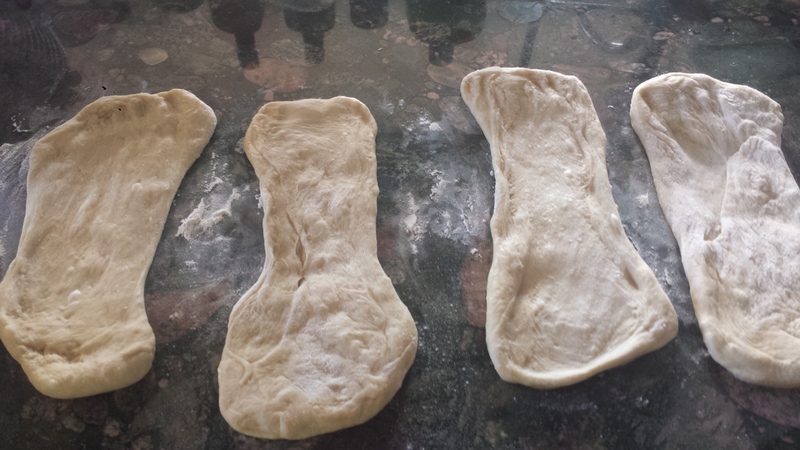 You do not have to wait around the house while the dough is rising. If you are out doing errands, don’t stress about the timing. 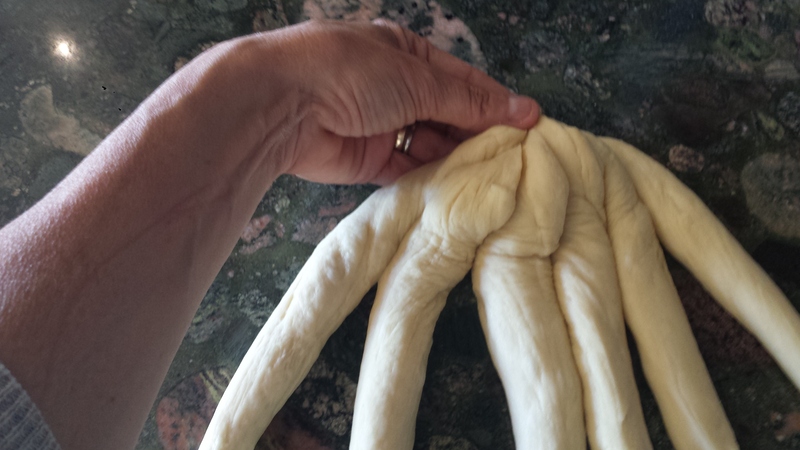 The dough will still be ready when you get home (within reason). 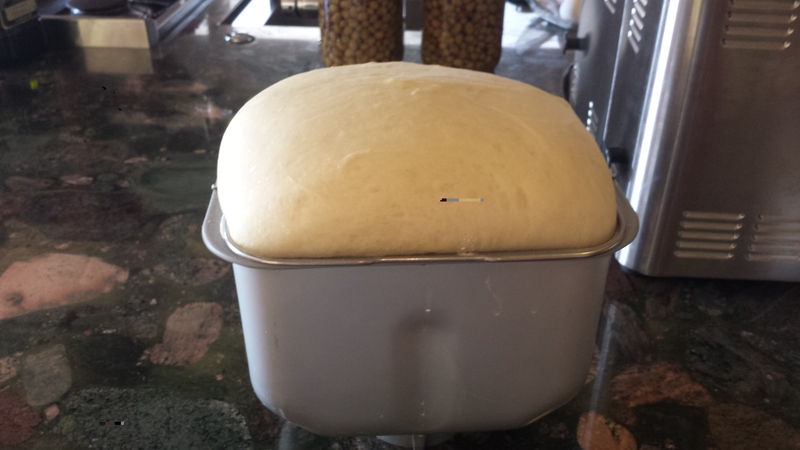 On the flip side, if your dough has risen to the top of the breadmaker but the clock says you still have 20 minutes left to rise, just take it out and start rolling. It’s ready. 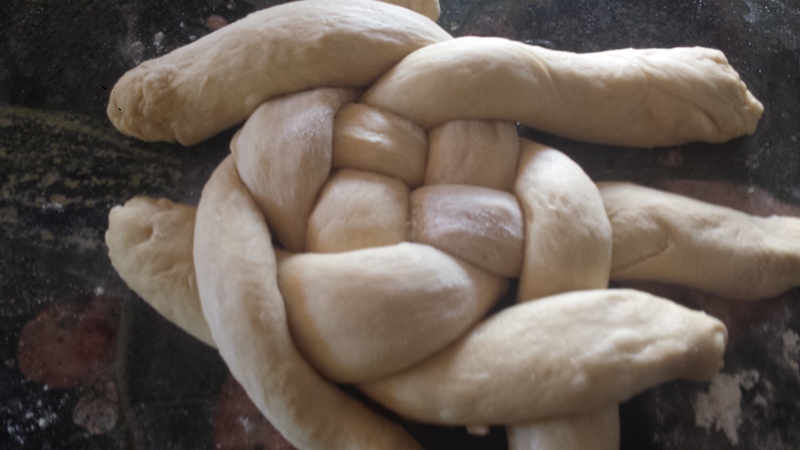 Above all, enjoy the process, especially the braiding. 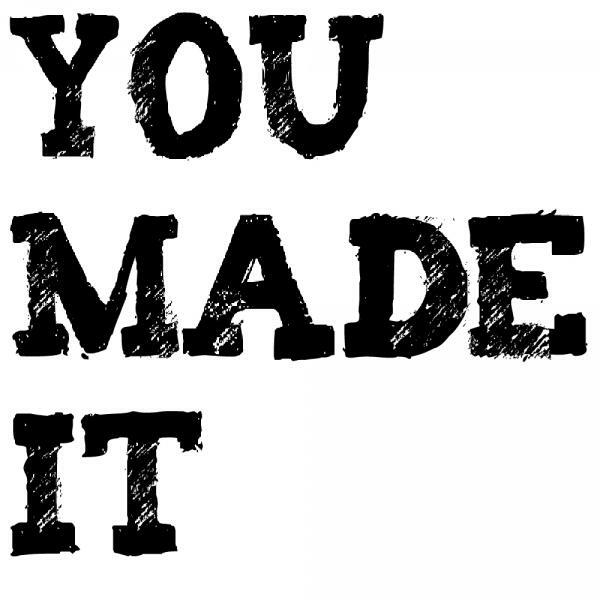 It’s fun and the end result is quite rewarding. 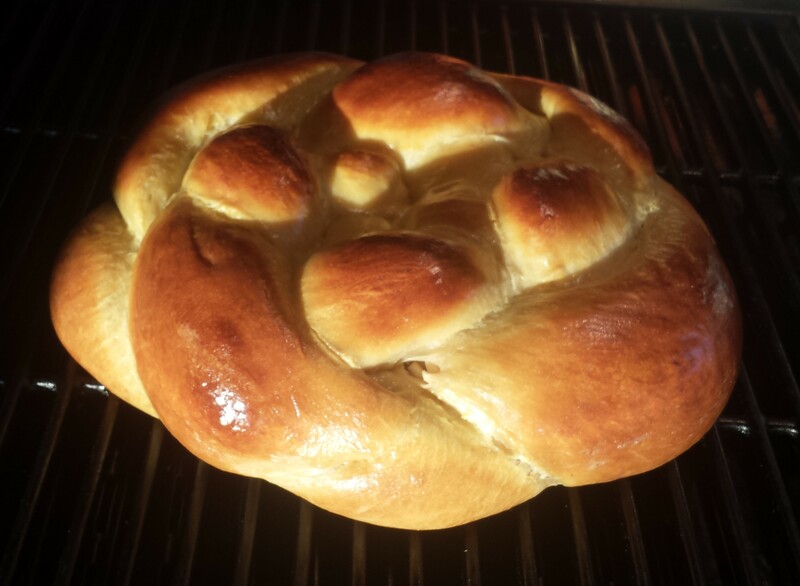 TIPS: All ingredients must be at room temperature, including the yeast or it won’t activate properly. If you have forgotten to take the eggs out of the refrigerator, put them in a bowl of lukewarm water for about 10 minutes. 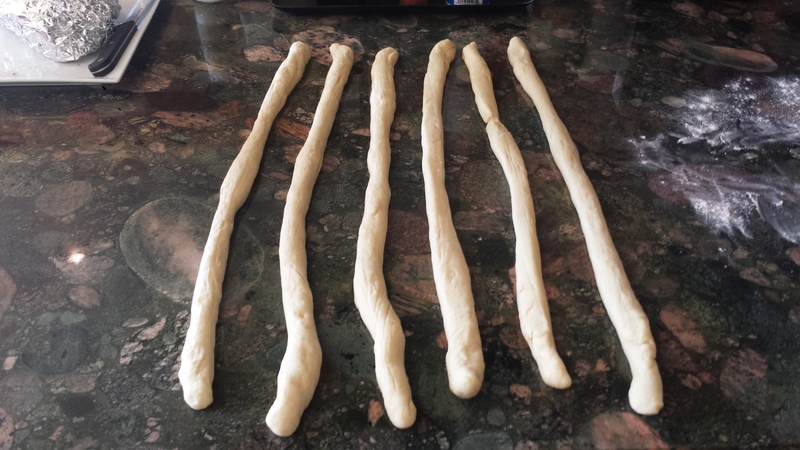 Cold yeast can be premeasured into a small dish and left to warm up for about 10 minutes. 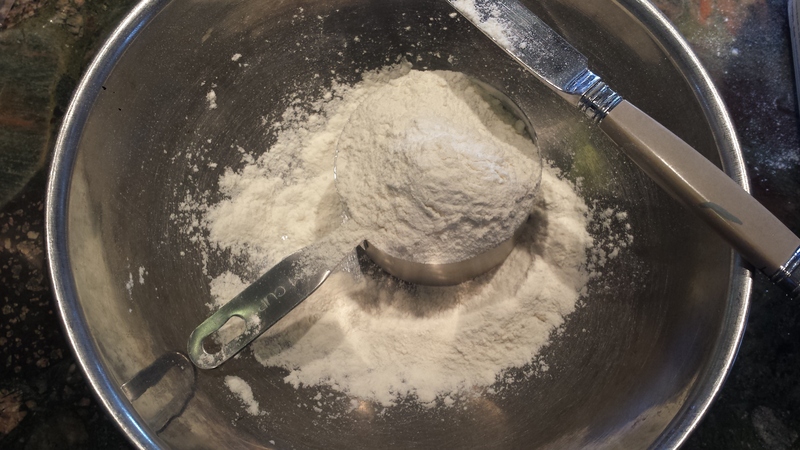 In measuring flour, never scoop the flour out of the container as it can be more condensed and your measurements can be off. 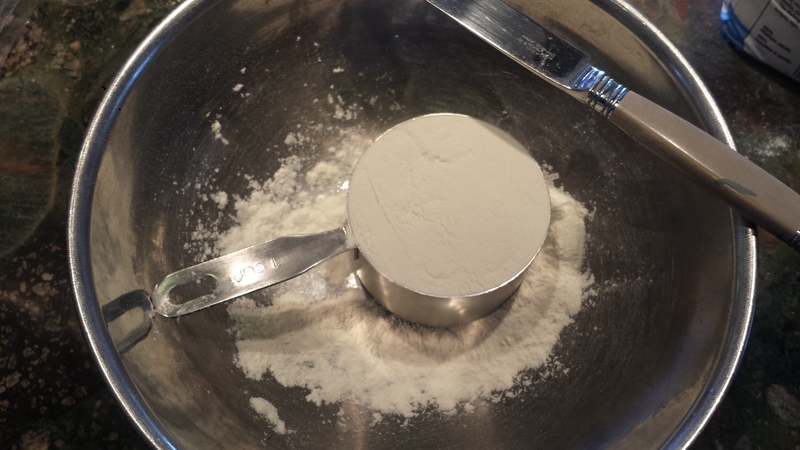 Instead, put your measuring cup in the bottom of a medium sized bowl and pour the flour into the cup. 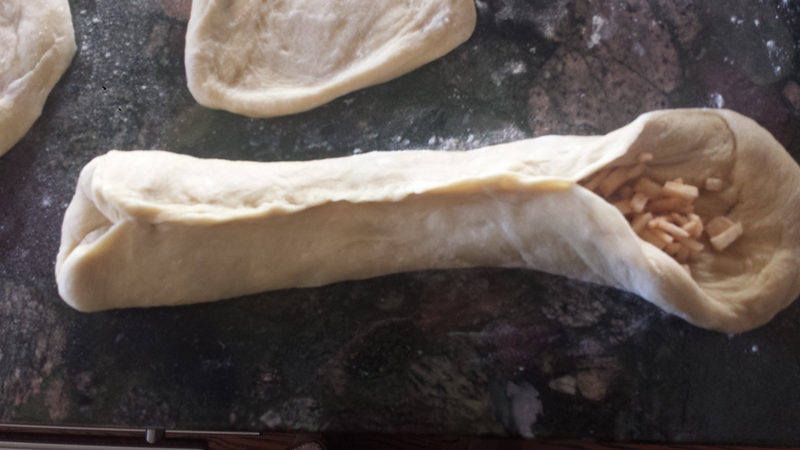 Using the flat edge of a knife, remove extra flour. 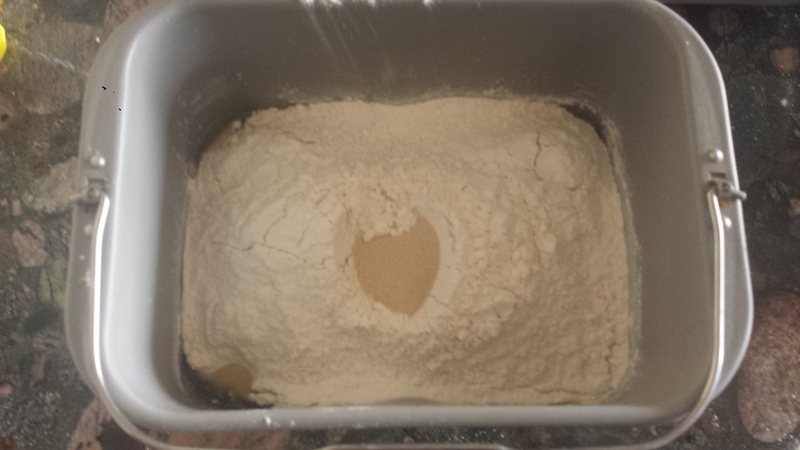 After measuring, pour excess flour back into the container. Put ingredients in breadmaker in the order listed. 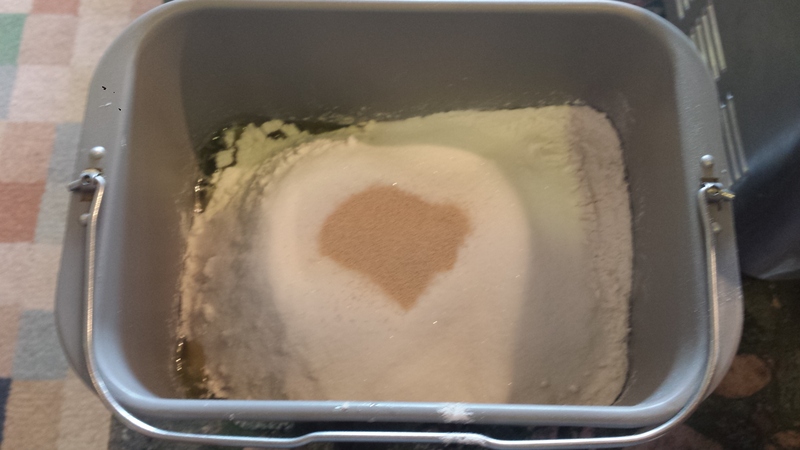 Make a shallow well after adding the sugar and put the yeast it it. 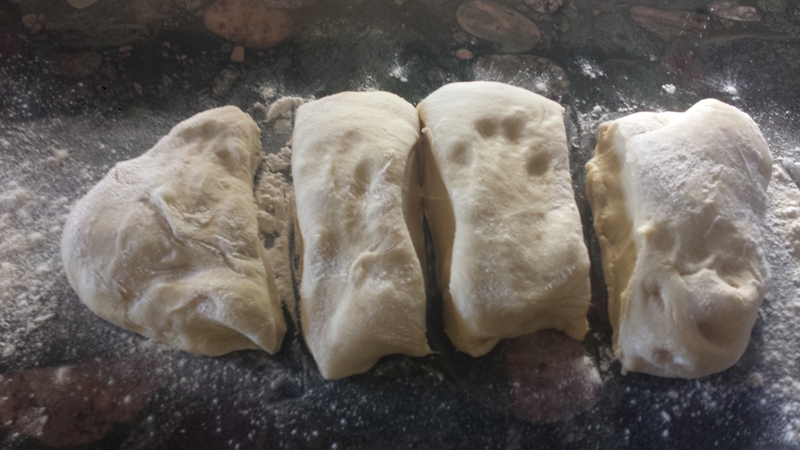 Process on the “Dough Only” cycle. In my machine this is an hour and a half process but sometimes I let it continue to rise another 30 minutes. 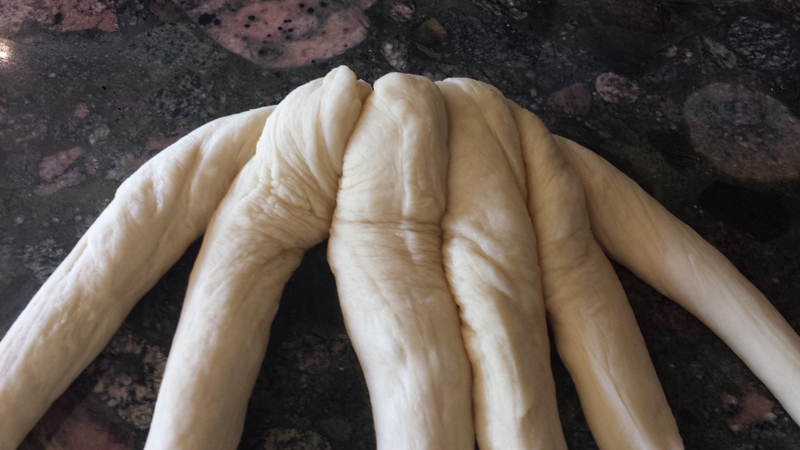 Remove the dough from the machine. 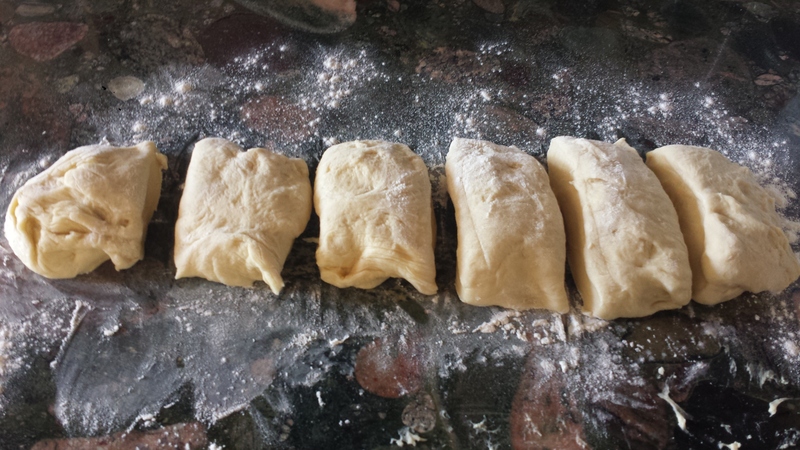 If it seems slightly sticky, lightly flour your working surface. 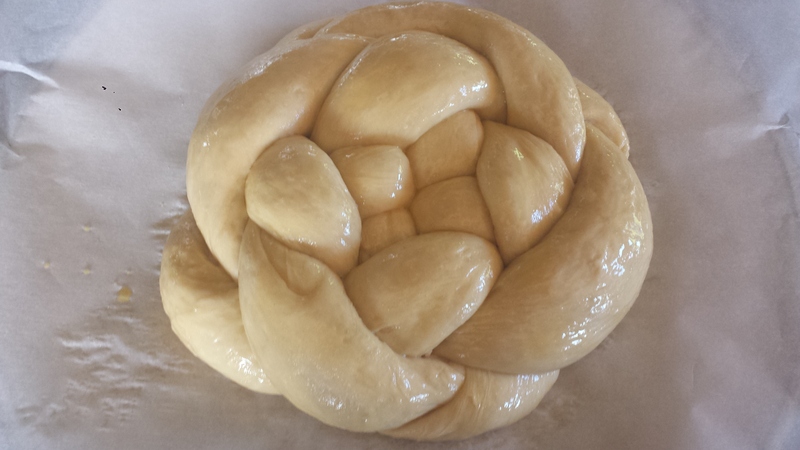 Divide the challah dough into 6 equal pieces, easiest done by cutting first in half and then each half into thirds. It’s okay if they aren’t exact. 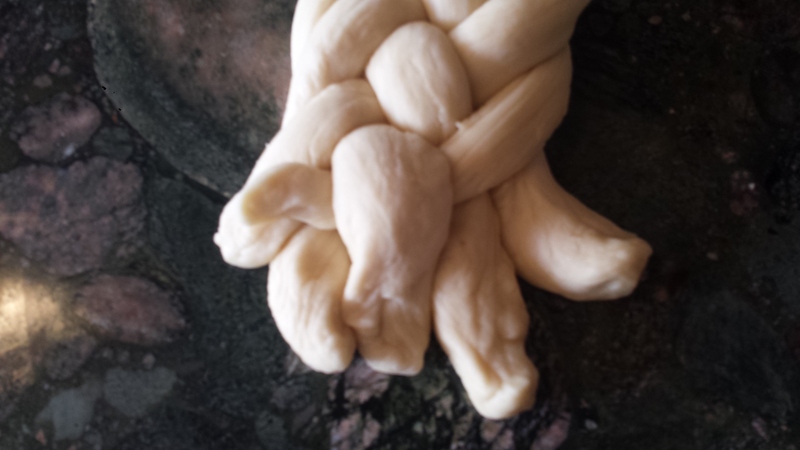 Roll each piece of dough into a long rope. 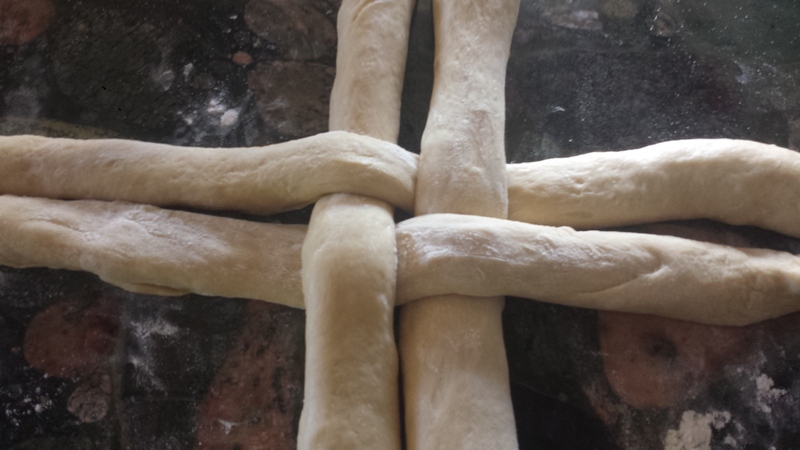 Line up the ropes and pinch them together at the top and fold the pinch under. 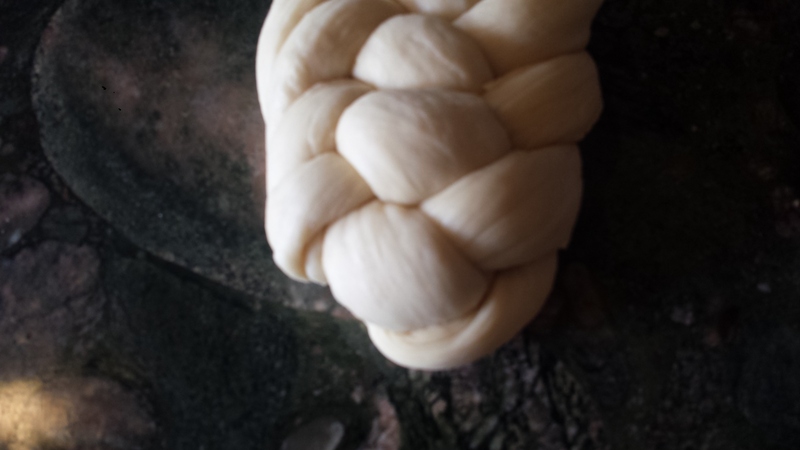 Braid from the right. Take the rope on the far right and go over two ropes and under one and then over two. 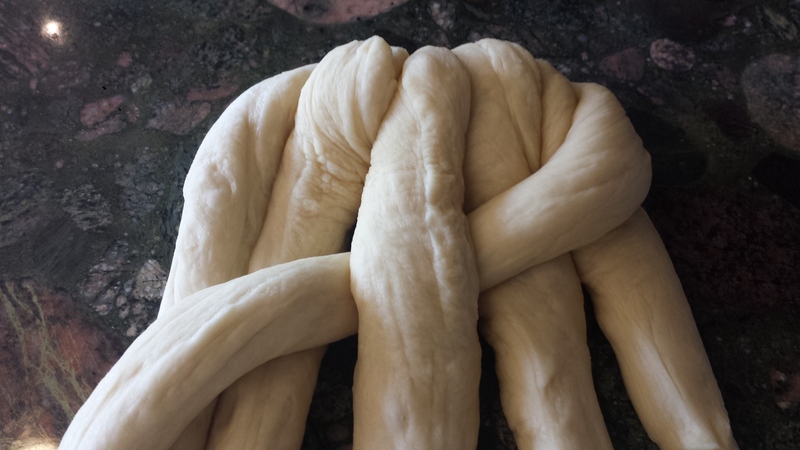 Repeat this process, always working from the right, pulling on the ropes a little if need be, until they get too short to braid. Tuck ends under and give them a pinch underneath to get them to stay. 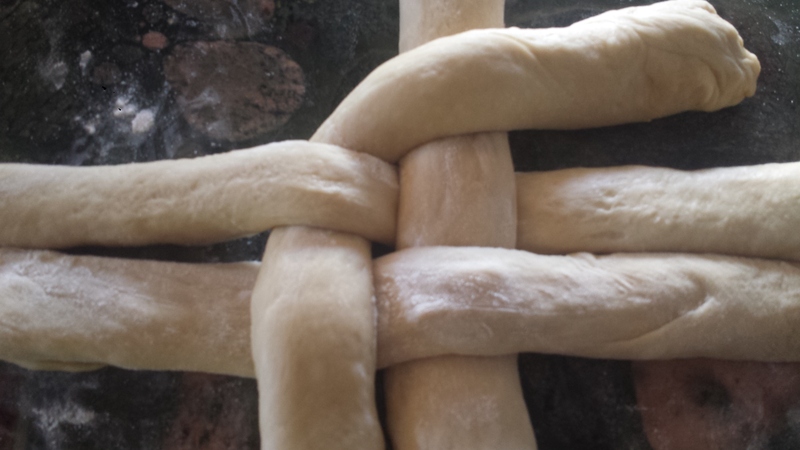 Reshape the top if necessary and check both ends to make sure they are secure. 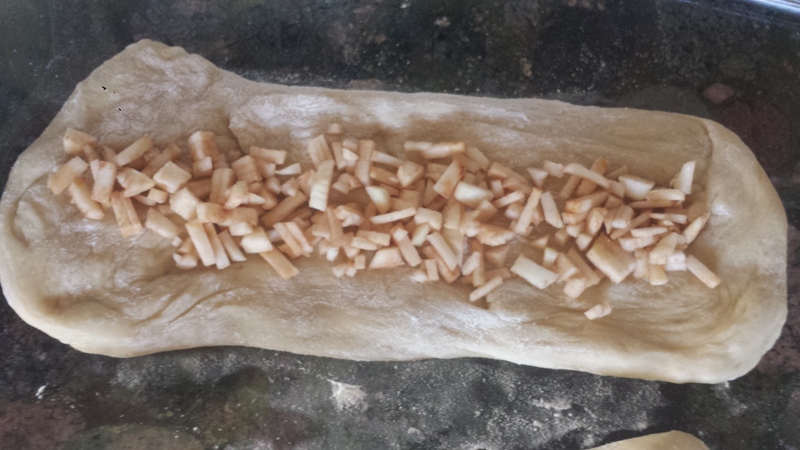 Transfer to a baking sheet covered with parchment paper or a silicone sheet. 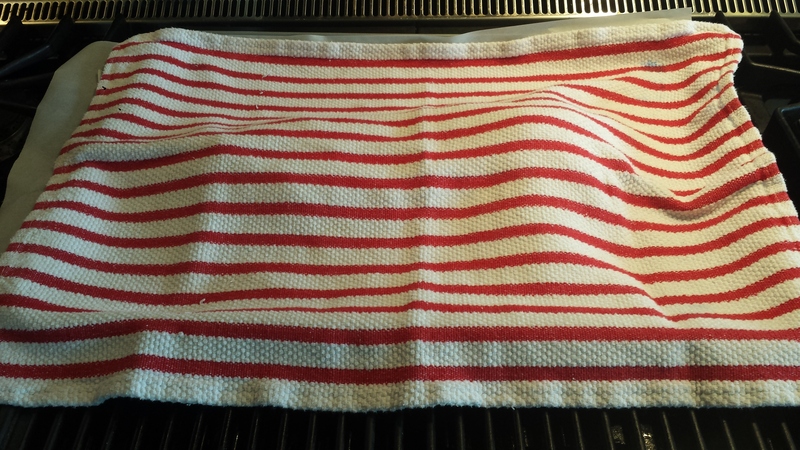 Cover with a clean towel and let rise in a warm place for 45 minutes to an hour. Heat oven to 350 degrees. 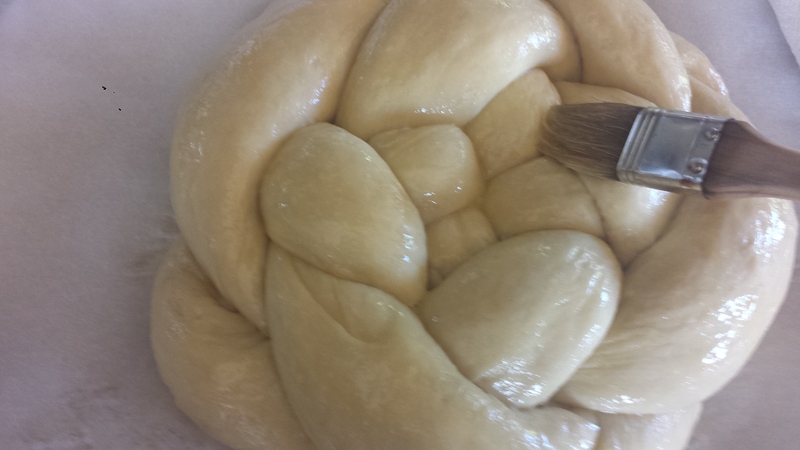 Beat remaining egg and brush it over the top of the challah. Reserve egg wash. Sprinkle with sesame or poppy seeds if desired. Bake about 30 minutes, or until golden brown. It’s better to overbake than underbake. Check at the 15 or 20 minute mark to see if any white cracks have formed near the folds from expansion. 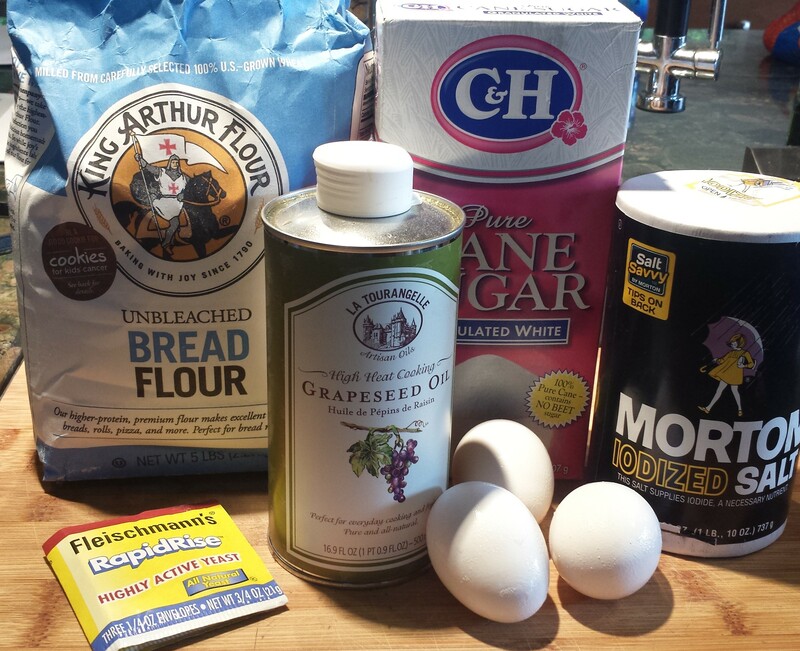 IF so brush on a light layer of egg wash and continue baking. If you make this or any other Goodmotherdiet recipe, please send me a photo either by posting a message in comments or send a message to the Goodmotherdiet Facebook Page and I will post your photo and comments to my new You Made It! Page. Love my readers! Check out what they’ve made so far. 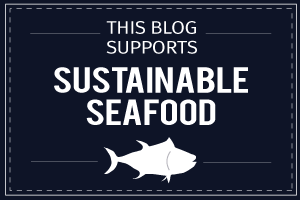 Click the link or the tab at the top of the page. Heat oven to 350 degrees. 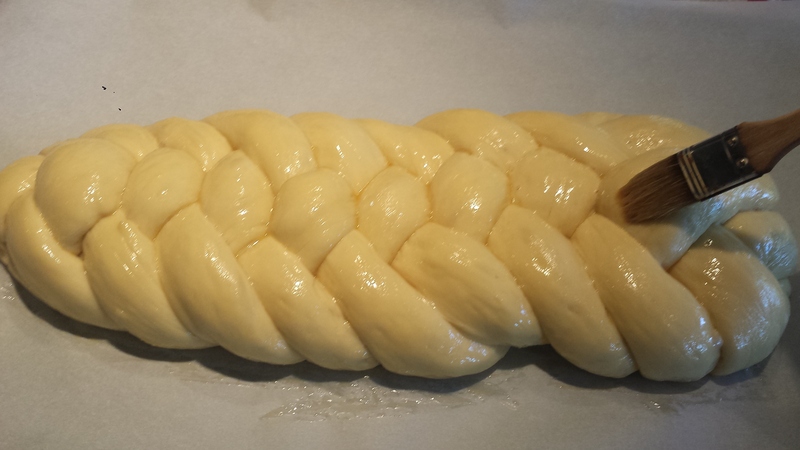 Beat remaining egg and brush it over the top of the challah. Reserve egg wash. Sprinkle with sesame or poppy seeds if desired. Bake about 30 minutes, or until golden brown. It’s better to overbake than underbake. Check at the 15 or 20 minute mark to see if any white cracks have formed near the folds from expansion. If so brush on a bit of egg wash and continue baking.